Sorry, I haven`t been around much lately. I feel so bad about it *tries to hide*. I`m still alone, as aruna7 moved. Because of this she has not this much time at hand. RL tends to ruin my plans as well lately. Yaaa, finaly some good news about this movie. I hope it´ll stay as it is. Once it was played in the movies, chances might be it will finaly get a DVD release also. It is about time. One more thing I need to add. I want to say Hello to the Community papawinchester who was so kind to put us on the list of affiliates . After jensenated it is the 2nd on our list. Thank you !!! IMO there are not enough GOOD SPN/John Icons around, so I want to share some Icons in here. It is this time again, where I just could not resist any longer. So I finaly finished the Screencaps for "Jam". So, here I was, burried in DVDs. I bought the Grey`s Anatomy Season 3.2 DVDs, which has been released in Germany recently (finaly). Spoiler for Grey`s Anatomy "Some kind of Miracle"
Caps: Supernatural Season 1 Ep. "Dead Man`s Blood"
Copy, and, slap it. I did these Caps sometime ago. Part one for "all of SPN"
Today I was busy ripping some of my DVD stuff, this is one of the files I got around doing. This is the season 3 Gag Reel of Grey`s Anatomy. So, seems Jeffrey was part of the Team that went to Comic Con because of "Watchmen"
Yaaaaa, way to go, first Con ever for him, at least as far as I know. This is an Interview they did at Comic Con. There are a lot of vids online at Youtube also for the "Watchmen" Panel. 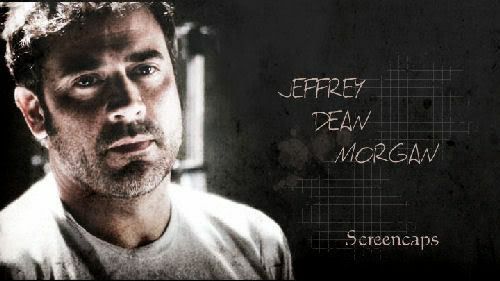 This Community is about Jeffrey Dean Morgan, and was founded by Aruna7 and myself, KJ@svala. This is our playground, and we try to do it differently than the many Communities that are already at LJ when it comes with JDM. In here we share everything we did OURSELVES for Jeffrey Dean Morgan. This includes Graphics, Music Videos, Clips, Screencaps aso. We also try to keep updated with everything Movie related, meaning, we have some Movie Trailer and Behind the Scenes online. More is to follow. We are not going to re-post each and every single new Picture that shows up online. There are other places for this to watch. And because we try to be different, and because we want this to be a happy place for everyone who loves JDM as much as we do (and because we are protective towards our place) Aruna7 and myself are the only ones able to post new Entries. But we would LOVE to see you around, we would be more than happy if we make YOU happy with what we update. So, feel free to add this Community onto your "To Watch" list. And we would also be more than happy to see you around from time to time. We DO NOT tolerate any kind of discussion about his Private Life, this is non of our business !!! Last but not least (or, beware Trolls !!!) we are going to delete each and every Comment that we might find unappropriate !!! And this is NOT the place to discuss what John might have done wrong in SPN, aso.